Why not? You'll be surprised at how tasty these old fashioned treats are and how fast they'll disappear. You’ll need a large watermelon and a water bath canner with rack and heavy-duty tongs. 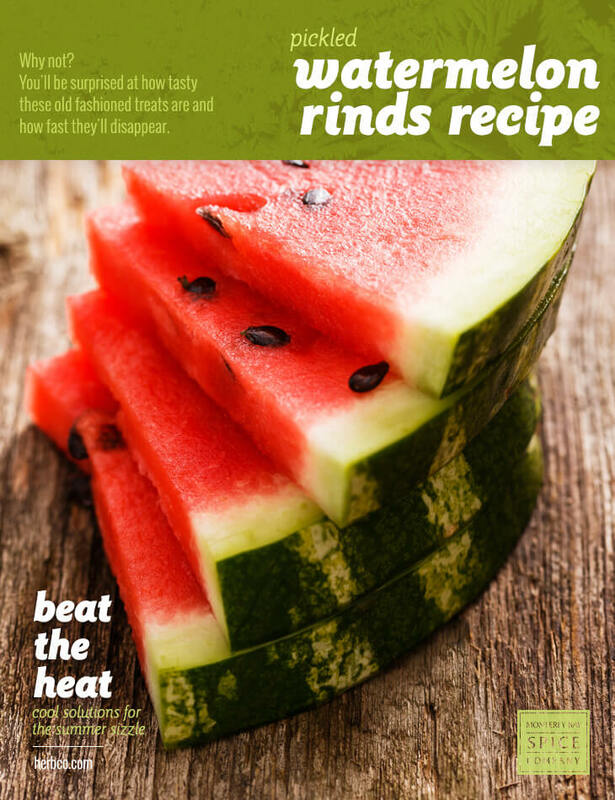 Make sure rinds are free of skin and pink flesh before cutting into chunks. In a large glass or ceramic bowl, combine water and salt, and then add rind pieces. Cover with a tea towel and let sit overnight. Drain and rinse rinds in fresh water in large colander. Place rinds in a large pan or Dutch oven and cover with the water. Simmer until just tender. Drain once more. In a large saucepan, combine sugar, vinegar and lemon slices. Place spices in muslin bag or wrap in cheesecloth and toss into the pan. Bring the mixture to a boil; then reduce heat and simmer 5 minutes. Add rinds and cook until they turn clear and the mixture becomes syrupy. Pack the hot rind mixture into sterilized 1-pint jars. Pour the syrup into each jar, leaving a ½-inch clearance at the top. Run a rubber spatula around the inner rims of each jar to remove any air bubbles. Wipe rims with a clean cloth. Position lids on jars and tighten down screw bands. Process the jars in a water bath canner for 10 minutes. * Canning salt is a fine, iodine-free salt used in preserving and pickling foods. You can find it in most major grocery stores, specialty shops and from various online sources.